Research on belief in the 2012 “apocalypse” demonstrates that specific psychological processes contributed directly to the maintenance of paranormal apocalyptic beliefs, even after the apocalypse did not occur. As is fairly obvious by now, the much-heralded end of the world in 2012 didn’t happen. Quetzalcoatl didn’t return on his raft of snakes. The earth was not torn asunder. Alien overlords did not materialize. It didn’t even rain very much that week. We were privileged to publish an article in the Skeptical Inquirer last year (Sharps et al. 2013) concerning the psychological factors that made it possible for modern human beings, even with modern access to scientific information, to believe in this type of baseless nonsense. We found that disturbingly high numbers of university students either believed in or entertained the likelihood of the “Mayan end of the world.” We found curious incoherencies in their patterns of belief: for example, many believers in the Maya “prophecies” did not believe in what those prophecies predicted. The idea expressed is completely illogical, but this illogical incoherency was in the minds of a great many people who were attempting to think about the 2012 apocalypse before it didn’t happen. Whether the believers expected world peace and a new age, or world destruction and apocalyptic doom, logical inconsistency was very commonly observed. This type of incoherency didn’t die with the nonexistent apocalypse; it’s still there, ready and waiting, in the minds of enormous numbers of True Believers. Dissociation, at a subclinical level, played a big part in our 2013 results. Those who exhibited dissociative tendencies exhibited a higher level of supernatural credulity in the belief that the Mayan apocalypse would actually occur. It is important to note what is meant by the term dissociation in this context. We emphatically do not refer to psychiatric concepts of dissociative identity disorder, or to a pathological level of dissociation in which psychotic ideation might occur. We refer to subclinical dissociative tendencies, of the sort probably experienced from time to time by most people. This type of dissociation may lead to a diminished critical assessment of reality. As discussed in earlier Skeptical Inquirer articles (Sharps 2012; Sharps et al. 2013), there may be anomalous perceptions of individual experience. The world may appear to be “not quite real or… diffuse” (Cardena 1997, 400). This is emphatically not “mental illness.” However, the disconnection with immediate physical reality that occurs with subclinical dissociation might incline many normal people to view highly improbable things with enhanced credulity (see DePrince and Freyd 1999). In previous work (Sharps et al. 2006; Sharps et al. 2010), including previous articles in the Skeptical Inquirer (Sharps 2012; Sharps et al. 2013), we addressed the role of dissociation in paranormal beliefs. We found that dissociation is associated with beliefs in ghosts, aliens, and “cryptids” such as Bigfoot, and that the subclinically dissociated are actually more likely to see these things, to interpret ambiguous stimuli as paranormal in nature. Where others see a hoax, those with dissociative tendencies see a flying saucer or the Loch Ness monster. Such subclinical dissociation is very important in producing and maintaining the credulous viewpoints involved in paranormal thinking. Credulous viewpoints, dissociated or not, are neither new nor rare. Humans have a long history of predicting our own doom, especially when that doom can be linked, however loosely, to the heavens. People see all sorts of things in the night sky, following which they tend to imbue them with supernatural significance. The Anglo-Saxon Chronicle for the year 793 (Ackroyd 2011, 63) records that the beginning of the Viking Age was heralded by immense lightning flashes (maybe so), and by fiery dragons flying in the sky (probably not). Lightning is of course dangerous, but it has a lot more to do with atmospheric electricity than with angry Norwegians storming ashore in Lindisfarne. As to the Chronicle’s dragons, well, people tend to create meaning in the things they seen in the sky, turning atmospheric abstractions into meaningful (and scary) images. For example, in 1528, the surgeon Ambrose Pare saw an aerial blood-colored human arm holding a sword, surrounded by axes, knives, and evil faces (Connell 2001). Obviously a portent, but equally obviously, such a thing could not actually exist in the sky. What did Pare actually see? With the passage of time, it’s impossible to be sure, but previous research (Sharps et al. 2009) showed that eyewitness errors of the imagination, in which reported features of a given scene have no existence outside the mind of the given witness, are in fact the norm rather than rare anomalies. We suspect that the good surgeon’s imagination got hold of a cloud, or a distant storm, and then went a bit too far. Or perhaps he saw a comet or a meteor shower; those things really turn on the imagination. In 1095, Bishop Gislebert of Lisieux interpreted a meteor shower as a go-code from God for what would become the First Crusade. In 1664, on beholding a comet, Alphonsus VI of Portugal ran through the night threatening the thing with a pistol; and in 1773, when Halley’s Comet turned up, clergymen sold tickets for seats in Paradise for the date on which the world was supposed to end. Who was supposed to take the tickets was never made clear, but this apocalyptic nonsense goes on and on, from age to age (Connell 2001). Our current age is no exception. The mass suicide of the Heaven’s Gate movement (e.g., Vick 1997), in which believers planned to depart Earth in a UFO apparently hiding behind Comet Hale-Bopp, and the Y2K phenomenon (e.g., Nolte 2009), in which many people believed that Ragnarok was going to hit because all the computers were going to stop working for no adequately explored reason, provide additional examples. In our modern world, apocalyptic and supernatural thinking are alive and well. One might think that compulsory education would cure this sort of thing, but that is not the case. Research has shown that college students frequently engage in supernatural behaviors in their examinations, especially when the consequences are perceived as particularly important (Rudski and Edwards 2007). In our work on the Mayan apocalypse, mentioned earlier (Sharps et al. 2013) 45.6 percent of these relatively educated people thought that world-changing events might very well occur at that time, and 9.8 percent were fairly sure that cosmic doom was imminent. So, our research told us that before the Mayan non-event of 2012, a frighteningly large proportion of the population entertained the magical thinking involved in apocalyptic prophecies. We also knew that definable cognitive incoherencies were involved, and we knew that individuals with subclinical dissociative tendencies (SDTs) were more likely to believe the pseudoscientific hype. But what would happen, psychologically, to the True Believers when Quetzalcoatl et al. failed to turn up and life went on as usual? Prior to the 2012 lack of apocalypse we had decided to conduct studies both before and after the relevant date. However, as we began to collect data on this second half of the project, we experienced a kind of collective intellectual doubt. After all, it wasn’t going to be very interesting. We knew what we were going to find: those who originally believed in doomsday would obviously disclaim these beliefs afterward, dissociative tendencies or not. It seemed hardly worth our time to complete the study. We were absolutely, and amazingly, wrong. In 1956, Festinger, Riecken, and Schacter published a fascinating study of a splinter group who believed in an earlier version of the ever-recurrent apocalypse. This particular bunch of True Believers, led by a lapsed Scientologist named Keech, gave up their jobs, spouses, and assorted other valuable aspects of life for the opportunity to fly with obliging aliens, in a literal flying saucer, to the entirely fictional planet of Clarion. Boarding was to commence at midnight on December 20, 1954, in time to avoid an enormous flood that was scheduled to destroy the rest of the world. The Believers gathered together. Everybody sat there for about four hours. Keech started to cry. Forty-five minutes later, Keech got a call (by “automatic writing”) from God, who had decided not to kill everybody for divine reasons, mainly because Keech’s followers had in fact been so amazingly wonderful in, well, sitting around waiting for nonexistent aliens at the boarding gate. Now, you wouldn’t expect that anybody over the age of six would be fooled by a cobbled-together last-minute desperate mess like this, but apparently Keech’s devotees bought it. They began to proselytize even more than they had before their promised event had failed to materialize. Festinger and his colleagues used this deplorable incident as the basis for their important research on cognitive dissonance. Cognitive dissonance basically comes down to the following fact: the more you pay, the better you like. In other words, if I make a substantial investment in anything, whether financial or emotional, in a business, an attitude, or an idea, I am more likely to place a high value, and consequently a high resistance to rejection, on that investment. A full discussion of this concept is provided in an earlier Skeptical Inquirer article (Sharps 2014). This phenomenon was strongly demonstrated in the realm of apocalyptic thinking by Festinger and colleagues (1956), as mentioned. Even though nothing happened on the fateless night of December 20, 1954, Festinger et al. found that many True Believers in Keech’s end of the world not only retained their previous beliefs, but in fact were galvanized in those beliefs by the failure of the apocalypse. Their faith, they believed, had staved off disaster for the present, but the inevitability of the end of the world was actually, and paradoxically, reinforced for these people. Cognitive dissonance provided an enhancement of their deluded beliefs, even in the absence of any real-world evidence that these beliefs might be correct. In 2012, we were repeatedly told by many media stories that the world would end on December 21 of that year. It was suggested that this was predicted by the Maya, given that this date coincides with the end of a calendrical cycle, a baktun, within their “long count.” This date was also suggested to coincide with a “galactic alignment,” a phenomenon that had less to do with astronomy than it did with vague nomenclature concerning what actually constitutes, in cosmic terms, a line (e.g., Krupp 2009). Even if such an alignment were a scientific reality, it would have no earthly significance; and anyway, there is at least one Maya document that mentions December 21, 2012, without any apocalyptic significance at all (Bower 2012). In 2014, we’re coming up on the sixtieth anniversary of the aborted trip to Clarion in 1954, and on Festinger’s classic study of 1956. Has there been no advance, in over half a century, in appropriate scientific skepticism that would defeat cognitive dissonance and result in a rational acceptance of the facts in the wake of yet another failed apocalypse? One hundred and four college students at a California university completed several surveys in which they were asked to rate the degree of their earlier belief, after the fact, that major world changes were going to happen on December 21, 2012. They were also asked about the sources of this belief, and about their specific beliefs concerning what, precisely, was supposed to happen on that date. Subclinical dissociative tendencies of the given respondents were measured by means of the standard Dissociative Experiences Survey (Carlson and Putnam 1986). The respondents in this research, college students, continually engage in critical thinking and the scientific evaluation of information. Even so, this population gave evidence of unexpected levels of credulity in the case of the 2012 apocalypse. In our research prior to the non-apocalypse, 44.6 percent stated that they anticipated no major changes on 12/21/12, or that such changes would be very unlikely. In our present research, 23 percent stated that they had believed in, or at least entertained, the end of the world on this date—in other words, about half of those who had believed before the date were willing to admit these beliefs. Eleven out of the 104 respondents, 10.6 percent, believed that this apocalyptic event was still going to happen. This is very close to the 9.8 percent who were certain, before the fact, of the apocalypse (Sharps et al. 2013). Festinger et al.’s 1956 cognitive dissonance concept is the most parsimonious explanation of this result; about one in ten people were evidently unable to overcome their psychological investment in the 2012 phenomenon. But what were the cognitive mechanisms underlying this investment, so strongly held that it kept operating in the face of a non-apocalyptic reality? Dissociation continued to play an important role here. There was some good news: dissociation was not statistically important for the continuation of the overall belief in the 2012 end of the world. Nor was there a relationship between dissociation and belief that major physical changes, social changes, extraterrestrial aliens, global warming, or climate change would herald the end. The Christian apocalypse, in which Jesus Christ is expected to return at the end of the world, was also not endorsed by those with dissociative tendencies. These null results were entirely consistent with our previous work before the December 21 date (Sharps et al. 2013). However, there was a relationship (R2 = .065, F [2,101] = 3.51, p = .034, β = .248) between SDTs and belief in the return of Kukulcan (Quetzalcoatl), the Mayan god anticipated in this particular apocalypse. Belief in the Mayan prophecies, with relation to SDTs, also remained significant, R2 = .101, F (3,101) = 5.68, p = .005, β = .377. Finally, and oddly, SDTs were significantly associated with belief that “computer simulations” predicted the apocalypse (R2 = .052, F [1,102] = 5.60, p = .020, β = .228), despite the fact that there were no such computer simulations at all. How can this pattern of results be explained? Previously (Sharps 2003; Sharps 2010; Sharps et al. 2013; Sharps and Nunes 2002), we presented a continuum in human information processing, in what is called Gestalt/Feature-Intensive (G/FI) Processing theory. This continuum ranges from feature-intensive processing, in which the specific details of a concept are given specific consideration, to gestalt processing, in which a concept is considered without detailed analysis, with relatively uncritical acceptance of the given idea as a whole. We suggest here a relationship between dissociative tendencies and gestalt, relatively uncritical, processing. In 2012, enormous attention was given to the Maya prophecies. This, according to the availability heuristic of Tversky and Kahneman (1973), made these prophecies relatively salient to the entire population. Now, modern people in the West, in general, have more knowledge of Christian ideas than they do of ancient Mayan beliefs. Therefore, a relatively feature-intensive analysis of the Christian intellectual realm is culturally forced upon us, even upon those with dissociative tendencies. So, the dissociated did not endorse the return of Jesus Christ as associated with the 2012 apocalypse. However, most of us know little of Mayan arcana. Mayan concepts are therefore necessarily less feature-intensive, and consequently more gestalt, for the vast majority of us; but, for most of us, this absence of detail does not result in credulity. For those with SDTs, however, this gestalt processing of an ancient culture’s supposed precognition was sufficient to generate belief. This hypothesis was further supported by the association of SDTs with belief in “computer predictions” of the end. Most of us, although we use computers extensively, are unfamiliar with their inner workings. Computer operations are ubiquitous (hence cognitively available as gestalts; Tversky and Kahneman 1973), and they seem terribly scientific; thus, in the SDT-related absence of feature-intensive consideration in favor of less-specific gestalt thinking, they might be assumed to be prophetic, accurate in their predictions. The fact that there were no such computer simulations may not have mattered to the subclinically dissociated; after all, to understand this would require the very type of feature-intensive thinking that is reduced in the presence of SDTs. More specific, feature-intensive concepts such as climate change were not endorsed. This was consistent with the tendency of subclinical dissociation to reduce feature-intensive analysis (e.g., Sharps et al. 2006; Sharps 2010). So, four psychological factors contributed to continued belief in the 2012 apocalypse: cognitive dissonance; dissociative tendencies; gestalt processing; and conceptual availability, as suggested by Tversky and Kahneman (1973). In the case of the 2012 Mayan apocalypse, an appreciable fraction of the population, about 10 percent, believed that the failed apocalypse was still to occur. The most parsimonious explanation of this rather incredible result lies in cognitive dissonance, the influence of psychological investment. Who held most strongly to that investment? Those with subclinical dissociative tendencies, which enhanced credulity through the reduction of feature-intensive analysis in favor of gestalt consideration. This, in turn, reduced consideration of the details that might attenuate beliefs in the supernatural. These beliefs were further guided by the availability heuristic of Tversky and Kahneman, by the relative availability of such concepts as Mayan prophecies and computer simulations in media. This four-point model is our best explanation of the belief in such bizarre concepts as the Mayan end of the world, and probably in other paranormal conceptions (Sharps 2012; Sharps et al., 2006; Sharps et al. 2010). These results provide a scientifically coherent explanation of current beliefs, even after the fact, in the 2012 apocalypse. How do we counter these influences? The answer is obvious. We need better education in science, in feature-intensive consideration of facts, and in the ability to analyze paranormal claims in terms of their specific details. For human beings, the world consists of a blend of objective reality and of our subjective interpretations of that reality; it is that subjective interpretation that is most subject to the salutary influence of education. Of course, this is hardly a novel concept. Plato called for essentially the same precision well over two thousand years ago (e.g., Cornford 1957). Socrates was killed by fellow Athenians in large part for insisting on this level of feature-intensive analysis. It is to be hoped that our modern world will be less draconian in the defense of its irrational paranormal beliefs. Ackroyd, P. 2011. Foundation. New York: St. Martin’s Press. Bower, B. 2012. Apocalypse not written in stone. Science News 182(3): 15. Cardena, E. 1997. Dissociative disorders: Phantoms of the self. In S.M. Turner and Michel Hersen (Eds.) Adult Psychopathology and Diagnosis, third edition, 400. New York: Wiley. Carlson, E.B., and F.W. Putnam. 1986. Development, reliability, and validity of a dissociation scale. Journal of Nervous and Mental Disorders 174: 727–735. Connell, E.S. 2001. The Aztec Treasure House. Washington, DC: Counterpoint. Cornford, F.M. 1957. Plato’s Theory of Knowledge. London: Routledge & Kegan Paul. DePrince, A.P., and J.F. Freyd. 1999. Dissociative tendencies, attention, and memory. Psychological Science 10(5): 449–452. Festinger, L., H.W. Riecken, and S. Schachter. 1956, reprinted 2011. When Prophecy Fails. Wilder: Blacksburg, VA.
Krupp, E.C. 2009. 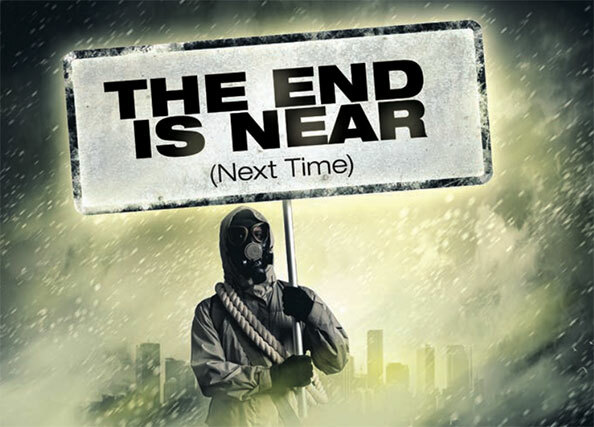 The great 2012 doomsday scare. NASA.gov. Online at http://www.nasa.gov/topics/earth/features/2012-guest.html. Nolte, C. 2009. False alarm of millennium: Y2K cost counties millions. San Francisco Chronicle, p. A2. Rudski, J.M., and A. Edwards. 2007. Malinowski goes to college: Factors influencing students’ use of ritual and superstition. Journal of General Psychology 134: 389–403. Sharps, M.J. 2003. Aging, Representation, and Thought: Gestalt and Feature-Intensive Processing. Piscataway, NJ: Transaction. ———. 2010. Processing Under Pressure: Stress, Memory, and Decision-Making in Law Enforcement. Flushing, NY: Looseleaf Law. ———. 2012. Eyewitness to the paranormal: The experimental psychology of the “unexplained.” Skeptical Inquirer 36(4): 39–45. ———. 2014. UFOs and cognitive science: A case study. Skeptical Inquirer. 38(3): 52–55. Sharps, M.J., J. Janigian, A.B. Hess, et al. 2009. Eyewitness memory in context: Toward a taxonomy of eyewitness error. Journal of Police and Criminal Psychology 24: 36–44. Sharps, M.J., S.W. Liao, and M.R. Herrera. 2013. It’s the end of the world, and they don’t feel so fine: The psychology of December 21, 2012. Skeptical Inquirer 37(1): 34–39. Sharps, M.J., J. Matthews, and J. Asten. 2006. Cognition, affect, and beliefs in paranormal phenomena: Gestalt/feature intensive processing theory and tendencies toward ADHD, depression, and dissociation. Journal of Psychology 140(6): 579–590. Sharps, M.J., E. Newborg, S. Van Arsdall, et al. 2010. Paranormal encounters as eyewitness phenomena: Psychological determinants of atypical perceptual interpretations. Current Psychology 29(4): 320–327. Sharps, M.J., and M.A. Nunes. 2002. Gestalt and feature-intensive processing: Toward a unified theory of human information processing. Current Psychology 21(1): 68–84. Tversky, A., and D. Kahneman. 1973. Availability: A heuristic for judging frequency and probability. Cognitive Psychology 5(2): 207–232. Vick, K. 1997. The purgatory behind Heaven’s Gate: Ex-member breaks his silence on cult. The Washington Post (May 2): p. C1.